SLADE sprang a few surprises during their set and consequently got a lot more people interested in them who otherwise would have refused to believe that four guys rarely far from the Top Of The Pops studio could turn them on. The truth, however, was heard all the way through their 55 minute set. Slade, it seems, are a natural festival band. Their madness balanced nicely with the more "serious" lineups and musically, too, they know where the essence of good rock lies. Visually, Slade can be pretty hard to take depending on how you like your music served up. Guitarist Dave Hill, for example, maintains an insane grin on his face while jumping on and off his speaker cabinets and scattering silver confetti around at regular intervals, but his antics never seem to get in the way of his highly commendable playing. Jim Lea on the other side of the stage, is another showman and he, too, had a penchant for dcaling his amplification. 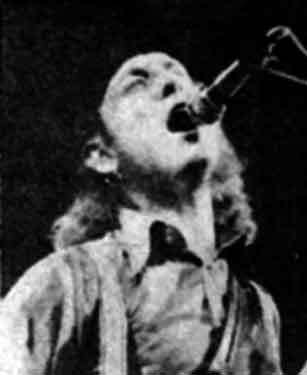 However, the band's cheerleader is Noddy Holder who delivers announcements in an exaggerated thicko accent. Everything about him is geared to coming on strong, both in his stage presentation and in his singing, but once you get over that and delve a little deeper you find Holder possesses a good late fifties rock singing style and is a well up to scratch rhythm guitarist. On paper Slade looked dreadfully out of place among all the heavies at Lincoln but on stage they more than held their own and, as I say, there must now be considerably more Slade aficionados than ever before.